There seems to be a growing consensus that the manner in which conditions for granting patent remedies are defined affects the scope of patent protection. It is also true in case of injunctions. When they are granted automatically to the patentees in case of infringement, their position is significantly strengthened. 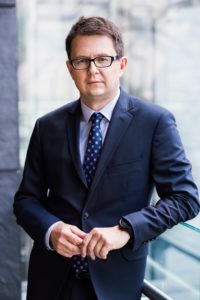 Rafał Sikorski of the Faculty of Law of the Adam Mickiewicz University in Poznan, Poland, and editor of the book Patent Law Injunctions, thinks injunctive relief should be applied in a flexible manner. ‘Otherwise, there is a danger that it will be used by the right holders as a tool to obtain excessive compensation for the use of their inventions, one that does not reflect properly their real value.‘ Kluwer IP Law interviewed Sikorski. How popular is injunctive relief? Is it used more often than in the past? ‘If you judge the popularity by the number of cases, many of them receiving significant coverage in the media or scholarly articles, conferences and seminars – than certainly injunctive relief has become a hot topic. And I think it will remain so in the future as well. This is for several reasons. First, many of the patent disputes in which patentees seek injunctive relief concern standard essential patents. The expansion of Internet of Things and the growing number of devices using standard technologies suggests that there will be more disputes related to the use of such technologies. Second, products have become increasingly complex. On some markets it is extremely difficult to design a product without encroaching on the rights already granted. In such cases, removing a product from the market or ordering its costly redesign, only because a minor feature of such a product is protected by a patent, often does not seem fair. Is there a big difference between jurisdictions in the use of injunctions? ‘My answer would be both yes and no. The major dividing line lies between common and civil law jurisdictions. In common law jurisdictions injunctive relief has its roots in equity, therefore it is by nature discretionary, whereas in civil law it has been applied rather automatically. But even in common law jurisdictions the degree of flexibility seems to have widened this century. In the UK for example, the courts used to ask whether an injunction would be grossly disproportionate, and only if that was the case would they be ready to deny it. In the US, prior to the eBay decision, the courts were also much more favourable towards the patentees. In civil law jurisdictions the courts resort to competition law and abuse of right doctrines to curb excessive enforcement via injunctions. One of the issues which is discussed in the book Patent Law Injunctions is abuse of right and competition law defences to injunctive relief as sources of flexibility. Could you say something about the main conclusions in this area? ‘Competition law was used as a defence against patent enforcement with success in Germany. German courts held that in certain circumstances patent holders by seeking injunctive relief may abuse dominant positions held on the market for technology. Unfortunately, the conditions for applying competition law defence set by the German Bundesgerichtshof in Orange-Book Standard were rather strict. This has changed since the CJEU decision in ZTE v. Huawei. There the CJEU proposed a much more balanced framework, one that allows to consider both interests of the patentees – owners of standard essential patents – and standard implementers. The problem is that competition law works as a shield against excessive enforcement of injunctions when the patentee at the same time wields substantial market power. What is your view on the US Supreme Court decision in eBay v. MercExchange? ‘The Supreme Court decision in eBay v. MercExchange has had tremendous impact in many respects. First, it had a direct impact on US law. After eBay the US courts no longer presume that infringement results in irreparable harm to the patentee. Thus, injunctions are no longer automatic. Do you think a judge should always be able to do a proportionality check before issuing an injunction? In the EU, for instance, this could be based on the requirement of article 3 of the Enforcement Directive, which stipulates that ‘measures, procedures and remedies shall be fair and equitable (…. )’ and shall also be ‘proportionate and dissuasive and shall be applied in such a manner as to avoid the creation of barriers to legitimate trade and to provide for safeguards against their abuse’. ‘I am sure that in many cases upon finding patent infringement injunctions will be still granted almost automatically. There is nothing wrong with this. But the courts should be given the option to deny an injunction or tailor such relief when it is necessary. What fundamental rights, for instance the lives of patients, are at stake if an injunction is requested in a conflict about medicines? Should this influence the decision of a judge? ‘In what you call conflicts about medicines, there are different rights and interests at stake. Certainly, there might be a strong public interest in providing access to medical treatment. The right to healthcare is also implicated. Of course, there is a public interest in maintaining a patent system that is capable of incentivizing innovation, including innovation in pharma industry, where R&D is particularly costly and the gains from a successful product are often used to finance research and development of products that turn out to be a failure in the end. These competing values need to be balanced. What is your view on patent assertion entities, patent trolls, patent privateers? Are their activities a widespread problem? ‘The activities of the so-called non-practicing entities certainly pose a challenge and also a threat for the patent system. The problem is that entities that come under the notion of the so called NPEs are not a homogenous group. You will find companies that are primarily involved in R&D activities on technology markets, as well as typical patent assertion entities that acquire patent portfolios in order to monetize their patents, often in an aggressive manner. You will also get privateers – companies with ties to competitors operating on product markets – which are set up only to collect royalties and initiate infringement proceedings against competitors of the companies that stand behind such privateers. It is especially these two types of NPEs that might harm competition and have a negative impact on innovation. What is the optimal model for granting injunctions? ‘Generally, I would say one which is capable of responding to needs of the markets, safeguarding innovation and competition as well as capable of addressing various public interest concerns. That certainly requires degree of discretion for the courts. The Kluwer Law International publication Patent Law Injunctions is a comparative work on injunctive relief in patent law in major jurisdictions around the world. It contains an extensive analysis of the United States, the European Union (EU), selected EU Member States (Germany, France, the Netherlands, Belgium, the United Kingdom and Poland), China, India, Japan and South Korea. It covers both preliminary (interim) and permanent injunctions.